In terms of intergalactic real estate, our solar system has a plum location as part of a big, spiral galaxy, the Milky Way. Numerous, less glamorous dwarf galaxies keep the Milky Way company. Many galaxies, however, are comparatively isolated, without close neighbors. One such example is the small galaxy known as DDO 190, snapped here in a new image from the NASA/ESA Hubble Space Telescope. ("DDO" stands for the David Dunlap Observatory, now managed by the Royal Astronomical Society of Canada, where the catalog was created). 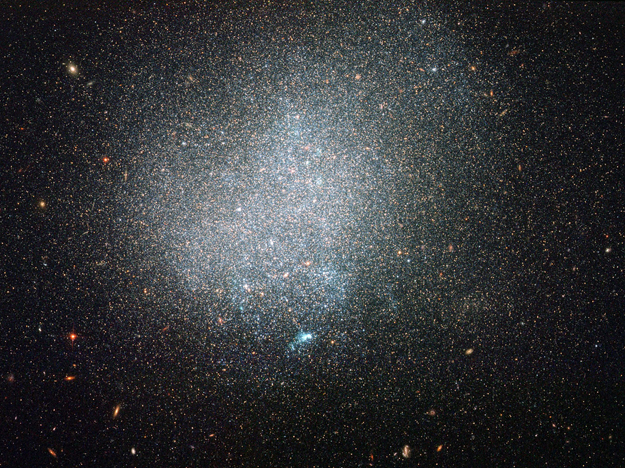 DDO 190 is classified as a dwarf irregular galaxy as it is relatively small and lacks clear structure. Older, reddish stars mostly populate DDO 190's outskirts, while some younger, bluish stars gleam in DDO 190's more crowded interior. Some pockets of ionized gas heated up by stars appear here and there, with the most noticeable one shining towards the bottom of DDO 190 in this picture. Meanwhile, a great number of distant galaxies with evident spiral, elliptical and less-defined shapes glow in the background. DDO 190 lies around nine million light-years away from our solar system. It is considered part of the loosely associated Messier 94 group of galaxies, not far from the Local Group of galaxies that includes the Milky Way. Canadian astronomer Sidney van der Bergh was the first to record DDO 190 in 1959 as part of the DDO catalog of dwarf galaxies. Although within the Messier 94 group, DDO 190 is on its own. The galaxy's nearest dwarf galaxy neighbor, DDO 187, is thought to be no closer than three million light-years away. In contrast, many of the Milky Way's companion galaxies, such as the Large and Small Magellanic Clouds, reside within a fifth or so of that distance, and even the giant spiral of the Andromeda Galaxy is closer to the Milky Way than DDO 190 is to its nearest neighbor. Hubble's Advanced Camera for Surveys captured this image in visible and infrared light. The field of view is around 3.3 by 3.3 arcminutes. A version of this image was entered into the Hubble's Hidden Treasures Image Processing Competition by contestant Claude Cornen. Hidden Treasures is an initiative to invite astronomy enthusiasts to search the Hubble archive for stunning images that have never been seen by the general public. The competition has now closed and the results will be published soon.